A few days early, I have released the PDF edition of the March issue. Also, a print version is available here. This issue is grade-A super-fine. With new stories from Cat Rambo, Rick Novy, Derek J. Goodman, and Michael Andre-Driussi, it will amaze and delight. We also have first-rate entries from Michael C. Lea and Scott H. Andrews, as well as the fine sf debut of Ben Phenicie. 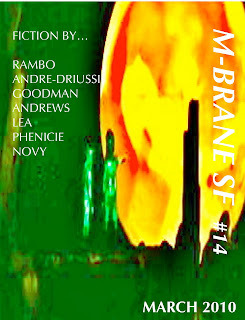 Subscriptions to M-Brane and single copies of the issue #14 PDF can be ordered here. As with the last issue, #13, there is not yet a mobi or other non-PDF ebook format ready to go. Long story short: I am suspending at least temporarily most of my involvement with the Kindle store save for some current and upcoming book titles. This is due to a couple of annoying facts about the Kindle store, and I'm also trying to not wear out my friend Dan Tannenbaum with constant requests for help with ebook formatting. But I am in the process right now of reworking the ebook format situation for M-Brane and will have news of that shortly. I'm still learning how to do it, but I believe I will soon have the in-house ability to generate epub-formatted books and then render those into other formats as well. When that process is mastered, I will be able to offer electronic subscriptions to M-Brane in more formats than just the PDF, including getting it available for the Kindle again (though possibly not sold through Amazon...we'll see). I've gotten a couple of queries in recent months about the likelihood of there ever being a print subscription to M-Brane rather than having to buy it issue-by-issue as it has been so far. The problem with that is that there is no "print run" as such. There aren't copies sitting around here or anywhere waiting for buyers. I offer it by way of a print-on-demand service, and those per-copy prices that one sees there are literally as cheap as they can get doing it that way (I think my royalty on #14 is maybe fifty cents). I may switch fully over to a different service in the next few months, and that will probably bring the per copy cost down. But still, it's never going to get much cheaper than 5 or 6 bucks/copy...PLUS shipping. If I believed that there were even a handful of people that actually want to spend something like a hundred dollars or more per year to get M-Brane in print, I'd consider setting it up. But I don't think there is even one person who wants to do that. But let me know if I'm mistaken!